The western edge of Europe crawls with tourists. Bright t-shirts and shorts, sandals and clean shoes, selfie sticks and expensive lenses, hats and sunglasses. Buses fill parking lots. Vans empty out like clown cars. Every cliff comes with a fence and a sign to warn selfie-drunk people that this is not Disneyland​ and gravity still applies where the land ends. I’m exhausted from the night before. I woke up with the same aches I went to sleep with, the same tender skin, the same tired eyes. Four hours wasn’t enough to heal after thirty nine miles. 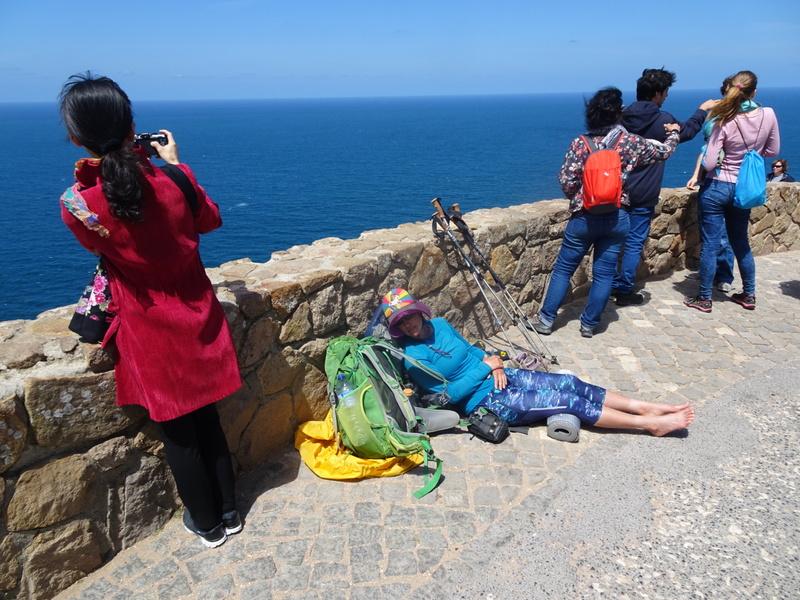 Then sun heated up and baked the pavement under my feet as Daya and I walked the last miles to Cabo do Roca. We crumple down against a railing, shedding our packs to sit on the stone walkway. A few feet away, a monument marks the western edge of Europe. I lean against my pack and stare. People come and go. Each snaps a picture with the monument, some use selfie sticks, some phones, some ask strangers to take it, others ask friends, some pose, others just click. They all look so happy. I eat a bag of potato chips then I stand and brush the dirt off my pants. I wander a bit, over to a cliff on one side, down to another cliff on the other. I snap a few pictures too, but I don’t really care. I thought I would, but I don’t. It just doesn’t feel like much. I shrug. Maybe that is true or maybe I’ll feel nothing in Tarifa too, maybe it will be the same as this, more steps and nothing more. I stare off at the sea crashing into the rocks below. I watch people snap pictures all around. Where did they come from to get here? Where did I? Has anyone ever walked here from Kinnarodden? I give up searching for a feeling that isn’t coming. I walk back to the monument. Daya is sleeping, slumped against a low wall, her hat pulled low, her pack next to her. I nudge her awake. “You ready to keep walking?” I ask. Posted in Europe North to SouthTagged Cabo do Roca, ENS, Europe North to South, featured, PortugalBookmark the permalink. The last step will be as important as the first step as the next to the last step is as important as every other step. They are all important. Life does not segregate; our minds do if we let it. Daya makes her pack and sleeping roll look as comfy as a lazy boy recliner!!! Amazing amount of miles!! !